CHASING 'RAFA' The ATP World Tennis Tournament is played at the Royal Tennis Club of Barcelona. Photo by www. 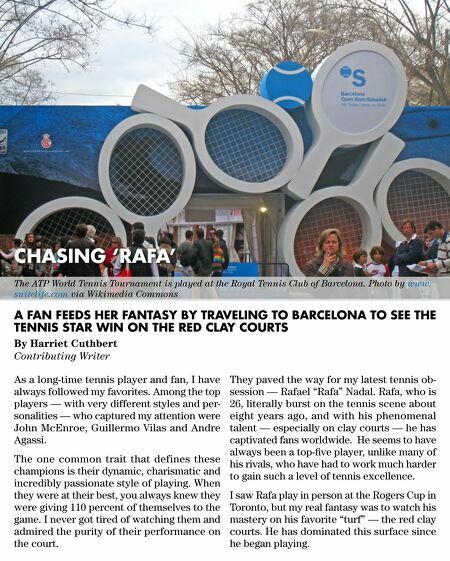 suitelife.com via Wikimedia Commons A FAN FEEDS HER FANTASY BY TRAVELING TO BARCELONA TO SEE THE TENNIS STAR WIN ON THE RED CLAY COURTS By Harriet Cuthbert Contributing Writer As a long-time tennis player and fan, I have always followed my favorites. Among the top players — with very different styles and personalities — who captured my attention were John McEnroe, Guillermo Vilas and Andre Agassi. They paved the way for my latest tennis obsession — Rafael "Rafa" Nadal. Rafa, who is 26, literally burst on the tennis scene about eight years ago, and with his phenomenal talent — especially on clay courts — he has captivated fans worldwide. He seems to have always been a top-five player, unlike many of The one common trait that defines these his rivals, who have had to work much harder champions is their dynamic, charismatic and to gain such a level of tennis excellence. incredibly passionate style of playing. When they were at their best, you always knew they I saw Rafa play in person at the Rogers Cup in were giving 110 percent of themselves to the Toronto, but my real fantasy was to watch his game. I never got tired of watching them and mastery on his favorite "turf" — the red clay admired the purity of their performance on courts. He has dominated this surface since the court. he began playing.